An opportunity to potentially be a part of the cannabis sector’s next amazing growth stock. Miami, FL – November 20, 2018 (EmergingGrowth.com NewsWire) — EmergingGrowth.com, a leading independent small cap media portal with an extensive history of providing unparalleled content for the Emerging Growth markets and companies, reports on Puration, Inc. (OTC Pink: PURA). The U.S. sports drinks market recorded sales of $6.33 billion for the 52 weeks ended February 25, 2018, according to data from Statista. 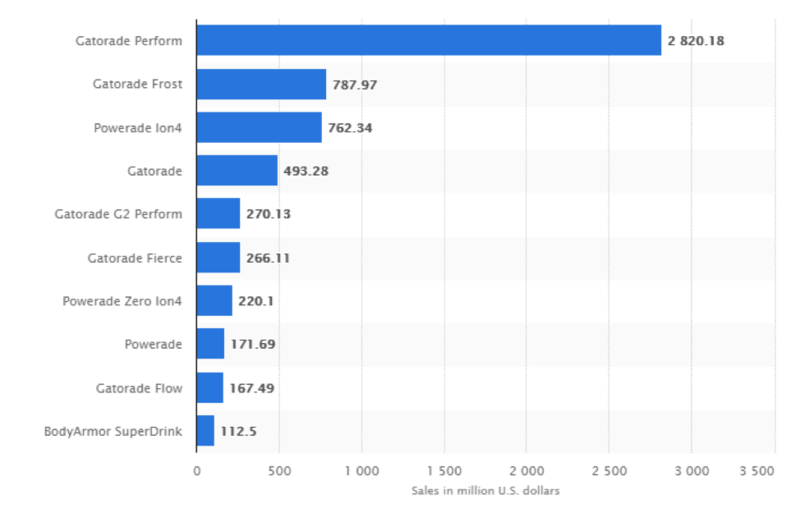 PepsiCo’s(NASDAQ: PEP) flagship sports drink, Gatorade, and Coca-Cola’s(NYSE: KO), Powerade, currently dominate this market, with their brands commanding a cumulative market share of well over 95%. Although PEP and KO enjoy a seemingly invincible duopoly in the U.S. sports drinks market, the future is anything but certain. Consumer preferences are quickly changing. One fundamental shift that has transformed the market is the heightened demand for drinks with less calories. Both PEP and KO have responded decisively to this trend by introducing low-calorie, sugar-free variations of their sports drinks. However, they haven’t demonstrated the same decisiveness in responding to another fundamental shift in the market, one that could profoundly change the playing field in the long-term—the growing demand for Cannabidiol (CBD) infused sports drinks. A lot has been written about the medicinal properties of CBD, the non-psychoactive compound found in hemp and cannabis. It has a host of medicinal properties, which include anti-inflammatory, pain relieving and it’s anti-epileptic, among others. In view of these medicinal properties, research and product development in the CBD space has gained pace in recent years, particularly with the onset of a more favourable regulatory environment in Canada and the U.S. As a result, Epidiolex, the first CBD-based medicine approved by the Food and Drug Administration (FDA), is now available across all 50 U.S. states. Epidiolex is manufactured by GW Pharmaceuticals (NASDAQ: GWPH), which at the time of writing, was the most valuable medical marijuana company with a market cap of $4.27 billion. Epidiolex’s runaway success, as well as increased public interest in CBD, has put CBD on the radar of many health-conscious consumers in the U.S. Some of these health-conscious consumers happen to be active sportsmen and women, who are keen on benefitting from the anti-inflammatory and pain-relieving properties of CBD. Even pro athletes, particularly those in physically exacting sports, are increasingly turning to CBD to treat pain and inflammation. Thanks to this heightened interest in CBD from the sporting community, the World Anti-Doping Agency removed CBD from its 2018 prohibited substances list. This means that if a pro-athlete tests positive for CBD, they will not be suspended or penalized in any way. It also means that the market opportunity for CBD-infused sports beverages is growing more attractive by the day. What are players like Coca Cola and Pepsi doing to capitalize on this opportunity, considering that they already enjoy a duopoly in the sports drinks market? Surprisingly, not much yet. Although credible reports have emerged that Coca-Cola is eyeing opportunities in CBD-infused beverages, the company is yet to announce any deal. Coca Cola’s and Pepsi’s slow response to the opportunity in the CBD-infused sports drinks market presents an immense opportunity for smaller companies in the space. They can build their customer bases from the ground up, which is a better strategy than—if the Coca-Cola and Pepsi were already in the market—penetrating an existing market dominated by Coca-Cola or Pepsi, who have larger marketing budgets and more established distribution networks. Importantly, smaller players also have an opportunity to position themselves as strategic partners or acquisition targets, as Coca-Cola, Pepsi or other any other large players are in the imminent future likely to opt for acquisitions or partnerships as their preferred market entry strategy. One small player in the CBD-infused sports drink market that is worth adding to your watchlist is Texas-based Puration Inc(OTCPK: PURA). Its CBD-infused flagship beverage, EVERx, which acts as a pain reliever and also helps with muscle soreness, is gaining traction in the fitness market. For the nine months ending September 30, 2018, revenue from EVERx grew over 400% to $868,300, compared with $168,000 for the same period a year earlier. Moreover, the company realized a 50% profit margin, reporting a $448,800 bottom line for the nine months period under review. What makes PURA an interesting play, at least when compared to other players in the space, is that it has divested all its other cannabis interests and now exclusively focused on beverages. This October, the company spun off its cannabis cultivation business to focus exclusively on the beverage segment. The spin off was executed through a securities exchange agreement with Nouveau Life Pharmaceuticals (OTCPK: NOUV), which we reported on here on Emerging Growth. Being a pureplay comes with its advantages, particularly if the area of focus is a high-growth nascent segment like the CBD-infused sports drinks market. Specialization allows a company to not only concentrate resources in activities that can generate the strongest returns, but also helps management build sector expertise. This is useful in a nascent sector as it positions a company as a knowledgeable player and puts it on the radar of bigger players who may be seeking to enter the market by through acquisitions or joint ventures. PURA’s strong sales growth in the first 3 quarters of the year, which has seen it draw closer to the $1 million revenue mark, already speaks to its strong understanding of the space. This could potentially capture the attention of bigger players seeking to enter the market. “One million dollars in annual revenue is an important benchmark for getting Puration’s EVERx CBD Sports Water on the radar screen of major beverage industry players, and that benchmark is now well within reach for 2018,” said Brian Shibley, CEO of Puration while releasing the earnings for the first nine months of the year. While there are a few other pure plays focusing on CBD-infused beverages, PURA is doing much better in terms of sales and margins. Rocky Mountain High Brand (OTCPK: RMHB), which started production of hemp infused food and beverage products in 2015 with a flagship energy drink, had sales of $240,701 in the first nine months of 2018, compared with sales of $122,638 in the first nine months of 2017. Although sales grew close to 100% in the period under review, it is still at a much lower level than PURA, despite the fact that it entered the CBD-infused beverage market two years ahead of PURA. PURA also enjoys impressive margins of 50%, as noted earlier in the section article. This allows it to price flexibly. According to information on PURA’s website, EVERx retails at $5 per bottle. In view of the 50% margin, this works out to a unit cost per bottle of around $2.50. This means that in the event of a price war, which is typical in nascent sectors, PURA could easily reduce the retail price from $5 to $3.50 (a 30% reduction) and still sustain profitability by increasing sales volumes, which is not an uphill task since the overall market is growing at a fast pace. The ability to price flexibly is a huge competitive edge that even market leaders like Coca-Cola, with its Powerade sports drink, don’t have. Importantly, EVERx is backed by two patents. This, coupled with the ability to price flexibly and strong sales momentum, heightens the prospects that the company will maintain a competitive edge in the sports nutrition and fitness marketplace for the foreseeable future. The prospects of EVERx are strengthened by the fact that it has a clear competitive edge in a sector that is set to grow in leaps and bounds. While the CBD’s potential in the overall healthcare sector is generally strong, its potential in the sports and nutrition market is even stronger due to the issues associated with prescription painkillers. Due to the opioid crisis, and the well documented challenges with addiction, an increasing number of athletes are looking for alternative ways to deal with pain. As a result, CBD has emerged as a strong alternative to prescription pain killers, with renowned sports personalities such as David Wells, the retired all-star lefthanded pitcher, championing for increased use of CBD. Wells, who played for nine baseball clubs in the course of his illustrious career, including the New York Yankees, notes in an interview that, for the better part of his 21-year career, he relied on a steady regiment of Vicodin, Percocet and Toradol to deal with pain. In the interview, he notes that the drawback with these painkillers was that prolonged use had dire consequences outside the pitch. “Eventually, I started using them recreationally,” noted the MLB pitcher, who admitted that he got hooked and even used the pills after retiring from pro-baseball. Wells, however, stopped using the painkillers when he was introduced to CBD, which has equally effective pain-relieving properties without the dangerous side effects of prescription pain killers. Thanks to the likes of Wells, more and more athletes are speaking out about the dangers of prescription painkillers and voicing their support for CBD alternatives such as CBD-infused drinks and CBD oils. Moreover, with the World Anti-Doping Agency having removed CBD from the list of prohibited substances for 2018, national leagues in various sports across the U.S. are likely to allow athletes to use CBD for medicinal purposes. Brands such as EVERx, which is already gaining traction in the fitness market, stand to benefit from this. Pro-athletics represents a huge opportunity because it comes with highly sophisticated marketing channels that help brands multiply reach and sales. Provided PURA maintains its competitive edge and builds on the momentum it has already garnered, it could in the min-to-long-term penetrate the pro-athletics market. This could lead to sustained growth over the next five years. Investors could benefit immensely from this as the company’s market valuation will naturally grow in tandem with the underlying business, unlocking value for those who buy the stock in the earlier stages of the growth cycle. PURA’s market cap, as at the time of writing, was $47.42 million. Its sales for the year are expected to pass the $1 million mark. This brings its forward price/sales ratio to 47.42x. The cannabis industry’s average price/sales ratio is 393.67x, according to data from CSI markets analysing Q1 and Q2 data for 2018. PURA is clearly one of the undervalued plays in the cannabis space, yet it has stronger growth potential than most overvalued cannabis stocks out there. Investors could reap handsome rewards, especially those who took advantage of the correction in mid-October, when the price dropped from $0.21 to the current $0.09. Currently trading around $0.10 – $0.11 we are not just talking about an opportunity to profit from the rebound, but an opportunity to potentially be a part of the cannabis sector’s next amazing growth stock.